Also new in this book is a reading group guide, designed for groups to read about, discuss, and implement many of the simple changes advocated for better health.A long, healthy life is no accident. It begins with good genes, but it also depends on good habits. If you adopt the right lifestyle, experts say, chances are you may live up to a decade longer. Buettner has led teams of researchers across the globe--from Costa Rica to Sardinia, Italy, to Okinawa, Japan and beyond--to uncover the secrets of Blue Zones. He found that the recipe for longevity is deeply intertwined with community, lifestyle, and spirituality. People live longer and healthier by embracing a few simple but powerful habits, and by creating the right community around themselves. InThe Blue Zones, Second Edition, Buettner has blended his lifestyle formula with the latest longevity research to inspire lasting, behavioral change and add years to your life.Region by region, Buettner reveals the "secrets" of longevity through stories of his travels and interviews with some of the most remarkable--and happily long-living people on the planet. It's not coincidence that the way they eat, interact with each other, shed stress, heal themselves, avoid disease, and view their world yield them more good years of life. 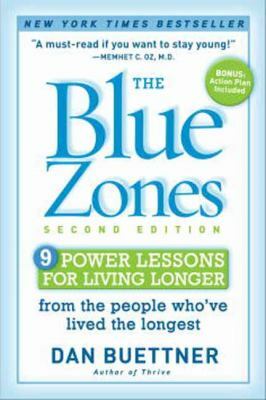 Buettner's easy to follow "best practices" and list of healthy lifestyle choices from the Blue Zones will empower readers to live longer, healthier, more fulfilling lives. DAN BUETTNER is the founder of Blue Zones, an organisation that helps us live longer, healthier lives. His ground-breaking work on longevity led to his 2005 National Geographic cover story Secrets of Living Longer and two bestsellers, The Blue Zones: Lessons for Living Longer From the People Who've Lived the Longest and Thrive.